In a bid to safeguard transparency and accountability around several themes concerning the Budget, the Committee on Diaspora and Non-Governmental Organisations (NGOs) of the Nigerian Senate in collaboration with Policy and Legal Advocacy Centre (PLAC) and UK‎ Department for International Development (DFID) on Wednesday, November 3rd, 2016 hosted an Interactive Session. The Session was between the Senate Committee on Diaspora and Non-Governmental Organisations and Civil Society Organisations on Nigeria’s Budgeting System with a Focus on 2016 Budget Performance and 2017 Budget. The Chairman, Senate Committee on Diaspora and Non-Governmental Organisations, Senator Rose Oko gave her opening remarks and extensively gave commended the efforts of the NGOs and CSOs partnership that has yielded a whole lot of benefits over the past years. “Senate therefore considered that the participation of CSOs could strengthen the legislators’ functions on budgetary matters by way of delivering research-based evidence and advice to members of the National Assembly”. 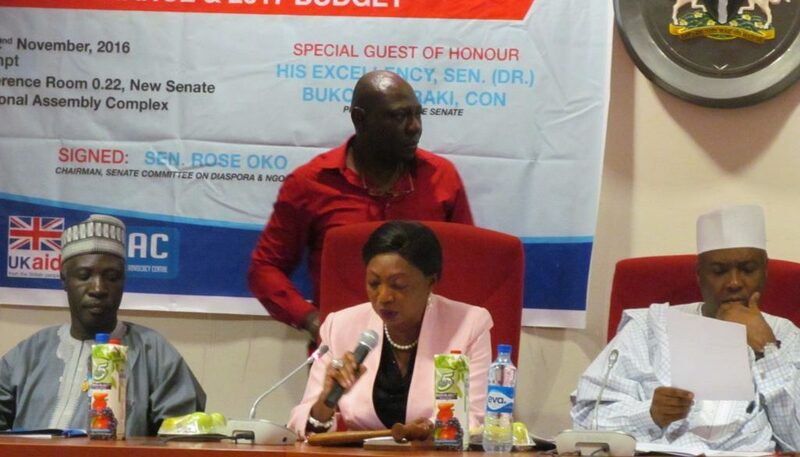 Senator Rose Oko reiterated further that the Senate, “Will use this forum to develop a functional framework that will enable us to achieve enhanced results in the budget system. Fundamentally, this meeting will offer us a crucial window to preview and endorse our Memorandum of Cooperation with a view to affirming the direction of our partnership. This development would enable us to commence without further delay, mutual activities and joint actions beneficial to our Nation”. She congratulated us all and welcomed us to this new bond of a working relationship between the CSOs and Legislature. The Chairman of PLAC, Mr. Clement Nwankwo was in attendance and also gave insightful tips on how the Senate can gain the CSOs trust. In attendance also was Dr. Otive Igbuzor, the Executive Director, African Centre for Leadership, Strategy and Development. He gave a detailed speech tailored towards ensuring mutual harmony of the CSOs and Legislature, he was, however very brave to point at the hollow points in the designing strategies of the budget and gave a broader overview. According to him, there were many lessons learnt from the 2016 budget implementation, some of which are: the Engagement by Citizens and citizens’ groups produced some positive reports in terms of reduction of frivolous expenditure. For instance, CSJ documented a total saving of N71,954,532,546.00 from the 2016. “Delay in passage of budget continued in 2016. This has the potential to affect budget performance negatively. There was low capacity in understanding the new budgetary approach of zero base budgeting on the part of public servant and civil society,” he asserted. He also made a deep dive into how Civic Education, Social, Economic and political resilience, budget literacy, comparative analysis of best practice in budgeting are the issues that formulate emerging consensus among civil society that needs to be addressed going forward. According to Dr. Igbuzor, there are three ways we could measure the impact level performance of the 2016 budget, they are: Input Level, which is how much of the budgeted amount was released and used in the implementation. Process, how the activities were carried out. Procurement process asks if the activities are carried out as and at when due. Output, Outcome and Impact levels concerns the immediate result of the activities. The effect of the budget activities or any change attributable to the budget actives and Change in people’s lives attributable to the budget respectively. Positive reactions and towards his remarks came from different sections of the room. Critical observations and assessment of Citizens’ priorities in Budgeting Formulations was made by Barrister Eze Onyekpere of the Centre for Social Justice. The Senate was reminded of their promise that, ‎”You made a promise to #OpenNASS, please open it up”‎ and this, to me was the highpoint of the Interactive Session.